Okay, so I haven't posted in a while....in fact, my last post was on Valentine's Day.....and oddly enough, my Valentine's Day article for LA VOCE is now posted online! So take a look - although a few weeks late, the story is still relevant. It is somewhat of a tribute to my Grandma Rose, who was a wonderful woman, and who would have been 81 this month. Great article...and great pictures! I remember my grandmother and grandfather making peppers and egg sandwiches every Saturday that I went to visit them, and that aroma will forever remind me of those great afternoons. 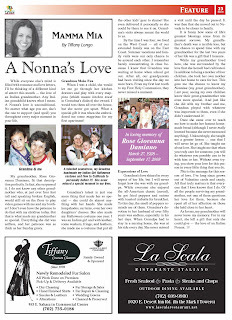 The real meaning of "nonna" is inside this super article! You are lucky, because you had a noonna like yours! I feel lucky ,too. My nonna was super too! Be proud of your Grandmother, her LOVE, and what you have lernt from that phantastic woman!